Looking back at my review of the first Sin City movie, I was surprised to discover I proclaimed it to be the best comic book movie ever. That was on the basis that it felt like a live action comic book, but it’s interesting to see how the movie landscape has changed since then. With regards to big budget spectacles, comic book movies are the norm rather than the exception now. So perhaps that’s part of the reason why A Dame to Kill For doesn’t feel quite so special. Primarily based on the second ‘Sin City’ collection, this film ties in closely with the first film. 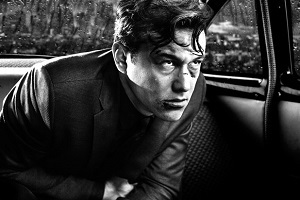 It’s taken nine years for the sequel to make it to the big screen, but A Dame to Kill For does a good job of reminding us of the salient plot points from the first movie. Trying to work out the chronology of events causes a bit of a headache, but that was also the case with the comics, if I remember correctly. Mickey Rourke, Jessica Alba, Rosario Dawson, Jaime King and Powers Boothe return, and we have a whole new host of stars to add to the list. Eva Green and Josh Brolin are at the forefront, but Joseph Gordon-Levitt and Dennis Haysbert (replacing Michael Clarke Duncan) have significant roles also. If you’re a fan of the first film, or indeed of the comics, I’m not sure how you could find fault with A Dame to Kill For. It feels like more Sin City, basically. Even better, it comes in at a nifty 100 minutes or so, which means it isn’t so much of a marathon. The pacing is much better too. It’s been a while since I’ve seen Sin City, but the visual effects are pretty much the same. Sure, there are sequences that are a lot more complex, but Rodriguez is a pro at making these kinds of greenscreen movies, and when the end result is so impressive to look at, it’s hard to complain. If the role of a sequel is to transcend the original, however, then this film definitely doesn’t do that. It’s the same booze, broads and bullets (heh…they should make that the name one of the collections!) as we saw the first time around. It’s the same expressionism meets noir, ultra-sleazy, ultra-macho stuff that Miller excels at, and the thing is, we’ve all seen femme fatales before, it’s just that here he tries to make the ultimate femme fatale. Basically, it’s as above, so below. But maybe audience – and my – expectations have shifted somewhat in the interim. This entry was posted in Film Reviews and tagged Action/Adventure, Comic Book, Noir by Stuart Wilson. Bookmark the permalink.